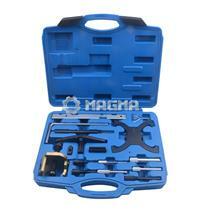 Combination kit of setting and locking tools suitable for a wide range of Ford petrol & diesel engines. Also suitable for these engines fitted in Land Rover, Mazda, PSA, Suzuki and Volvo vehicles. 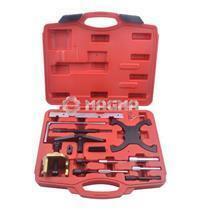 Kit consists of camshaft, crankshaft/flywheel and tensioner locking tools, plus camshaft sprocket remover.